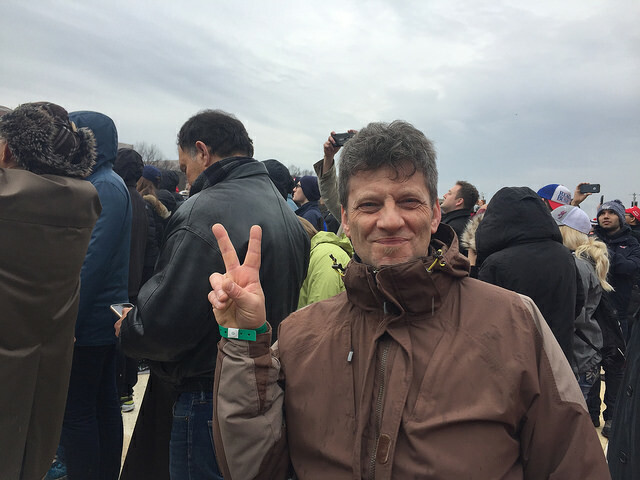 Don Krogman came from West Babylon, New York to see the inauguration. Photo by Rebeca Corleto. The overflow areas went unused. White plastic temporary flooring intended to be filled with supporters extended well past the last person in attendance. The inauguration of President Donald Trump yesterday did not live up to the hype. “I was shocked at how empty it is here,” said Sami Mehta, 18, a Dartmouth student who stopped by to see the inauguration in person. Don Krogman, 55, from West Babylon, New York lost his job at Victoria’s Secret, and has been out of work for a year and a half. He calls himself a “forgotten 55-year-old”, left behind by a changing society. “When you hear, ‘you’re bigoted, you’re a racist, you’re an idiot for voting—.’ How does that make you feel? I turn around and say, ‘I’m gonna do it again next year,’” he said. A lifelong Democrat, Krogman became an Independent after 9/11. His distrust of government and need for change, drove him to Trump. “I would’ve voted for [Bernie] Sanders until we found out that the Democrats don’t believe in democracy and selected Hillary [Clinton] to be their champion,” he said. Halfway between the Capitol and the Washington Monument the crowd thinned out. It was a vastly different scene than 2009, when the crowd spilled into the overflow areas, filling the National Mall for Obama’s first inauguration. Early estimates judge the Trump inauguration to have attracted one-third of the crowd of Obama’s. Many of the best seats at the inaugural parade were empty. Bridget Begdin of just outside Denver, Colorado, said Trump was her ideal candidate. 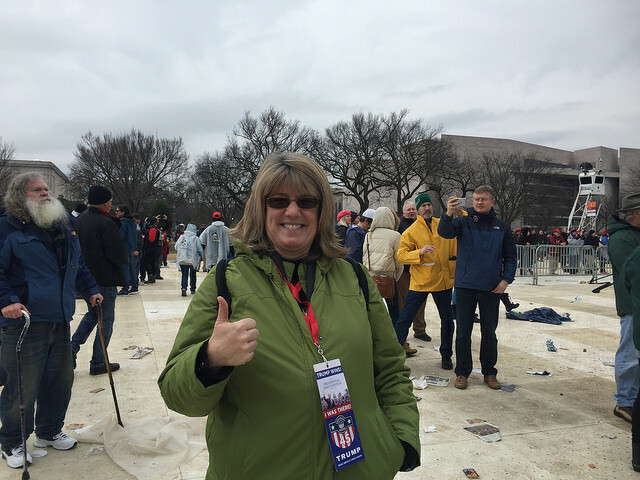 Bridget Begdin of Colorado attends her first inauguration to support Trump. Photo by Rebeca Corleto. But his message of hope doesn’t translate outside of his overwhelmingly white supporters. And the aggressive, dark tone of his inauguration speech, left non-Trump supporters with a different vibe. Many of Trump supporters drove hundreds of miles to witness his inauguration. David Wallace, 63, of Boaz, Alabama wore the red “Make America Great Again” hat, the ubiquitous accessory of Trump’s supporters. His Auburn University poncho kept him dry when the rain fell on cue with Trump’s inaugural address. Though Wallace is rooting for Trump, he is not blindly optimistic about the new presidency. The message was clear: Trump is on thin ice and expected to perform. Wallace’s main concerns were “getting people working again” and strengthening the military and borders. “He’s gonna pull the country together and if he doesn’t, in four years we’ll put him out of office,” he said.